Bruce Harvey was born in 1947 in the SW suburbs of London UK. He has dyslexia coupled with exceptionally high IQ. What he understands, he remembers. At 16 he obtained 4 O levels and moved to the County Grammar School for A levels. He dropped Geography after one year and continued with single maths and physics. London University wrote to the school about his application to point out that he would need one more subject either at O or A level. It was decided that he would change from the single maths set to the double maths set. (The others in this set were actually in their third year of A level study having taken O level one year early.) So Bruce returned after Christmas with only a term and a half to go and about one and a half years behind. The school provided no extra help. In spite of all this, he obtained B and C in maths and B in physics. At 16 he obtained 4 O levels and moved to the County Grammar School for A levels. He dropped Geography after one year and continued with single maths and physics. London University wrote to the school about his application to point out that he would need one more subject either at O or A level. It was decided that he would change from the single maths set to the double maths set. (The others in this set were actually in their third year of A level study having taken O level one year early.) So Bruce returned after Christmas with only a term and a half to go and about one and a half years behind. The school provided no extra help. In spite of all this, he obtained B and C in maths and B in physics. Bruce went to Royal Holloway College, London University to study physics in 1965. It must be remembered that in 1965 very few educationalists had ever heard of dyslexia and that most of those who had did not believe it really existed. For Bruce, reading was hard and the mental effort required to read left little capacity to understand what he was reading. In particular, it was virtually impossible for him to retrieve information from his own writing. Up till now, this had not been a problem because he had near perfect recall. To Bruce, revision was the lowest form of cheating. Bruce obtained a third class honours degree by the simple process of attending the lectures for three years, understanding and remembering them. With a professionally typed script, he was awarded the college prize in physic that year. But his two most treasured acquisitions were a wife and daughter. Bruce became a teacher and spent over 20 years continuing to fight the educational system. The last 9 years were spent in a Sixth Form College (16 to 19, all abilities) which was fighting closure. 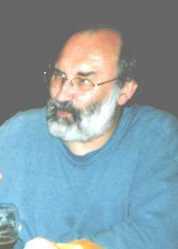 In the final years Bruce taught A level in Pure 1 and 2, Mechanics 1 and 2, Statistics 1, Computer Science first and second years and prepared to teach Electronics second year. Bruce had a breakdown through over work and stress and after two terms sick leave was granted early retirement on the grounds of ill health at the age of 46. To while away the years of retirement, Bruce returned to the study of physics. Now a gentleman of leisure, he was not under the authority of the system and was free to ask himself the stupid questions that would have had him thrown out of lectures. Like almost everyone else, he found special relativity hard to understand. While this does not not pose a problem to normal people who learn rather than understand, his dyslexic mind works in concepts rather than strings of words. He fretted with the twins paradox until he discovered that the proof of time dilation in his textbooks was a mathematical fiddle. Still suffering from the affects of his breakdown, he was reluctant to accept this. A year or so latter, he turned his attention to Electricity and Magnetism using his computer to perform numerical integrations. He invented a form of numerical integration where the size of increment is varied according to the rate of change. This allowed very precise results to be obtained in hours rather than weeks. His investigation of the magnetic field surrounding a single current loop proved the text books to be wrong. Three days later, he had constructed a 1m radius former and measured the inductances of different current loops. His calculations were right and the text books wrong. Encouraged by this, he went on to discover the field interaction equations which treat fields as energy density fields rather than as force fields. Now it was possible to do the integrations which the text books fail to mention because they give infinite answers. Looking back at some of the 19th century papers, he found one by Searl in which the man was trying to explain inertia in terms of electricity and magnetism. Searl expressed a hope that it might one day be possible to do this. Almost 100 years on Bruce tackled the problem again using his field interaction equations. It worked. More than that, Newtons laws of motion popped out and so did effects of extreme velocity almost identical to those predicted by special relativity. With the departure of his third daughter to university to study fine art, the fourth bedroom was converted from an art studio to an office and in October 1996 he started work in earnest on the link between "electricity and magnetism" and gravity. By Christmas, it was cracked. Since then, Bruce has been working on his web site and writing up his work. He found some slight errors in the work on the inertia of an electric charge and on sorting these out was able to extend the theory. Two papers were sent to Royal Society in September 1997, the first showing that acceleration of a charge at any angle to its line of motion caused the generation of an inertial force opposing the acceleration. It then showed that matter comprised of noting but charges (with no mass) would have the property of inertial mass by virtue of the electric fields of its charges and the magnetic field generated by the motion of their fields. The second showed how matter comprised of charges alone would have gravitational mass and generate gravitational fields. Since then, he has been working on new theory of magnetism which has a smooth transition between the macro world of electromagnetic components and the subatomic scale of the charged particles within atoms. In 2000 and 2001, he attended 4 conferences and papers published in the proceedings of Congress-2000 held in St.Petersburg and the Institute of New Energy 2001 Symposium. From this time on, all the new material added to his web-site was in the form of scientific papers. Then came the decision to write a completely new web-site which would be completed before publishing it on the internet. This would present a complete unified theory. He started to re-examine all his old work paying particular attention to the rigor of the mathematical proofs. Returning to relativity, he eventually came full circle from rejecting Einstein's maths fudges to proving that with the assumption of some form of background against which the electromagnetic effects are generated leads to the whole of SR can be deduced from the Classical Laws of Electromagnetism. This led to renewed effort to explain gravity. The new theory is based on the quark theory of nucleons and the properties of the electric fields of elementary charged particles coexisting in space and very slightly reducing each others ability to contain energy. It leads to a full explanation of the force of gravity and the effects of gravitational potential. Then he turned to Quantum theory and produced a classical theory of the atom by incorporating the quantisation of magnetic flux with electromagnetism and orbital mechanics. While work continues on the new website, he has published on his old web-site four papers on relativity, gravity and quantum theory. New web-site containing a unified theory was published on 20th May 2009.